My thoughts about wedding dresses and weddings are well documented. I largely believe expensive wedding dresses are stupid and that lavish weddings don’t make sense for most people. But like most things in life these things can’t be viewed only in black and white and my attention was directed recently to an organization that is doing very cool things with wedding dresses and weddings. Brides For A Cause is an organization with a “social mission to encourage women to reuse, resell and re-wear their wedding gowns to help make a difference in the world.” Check out their website – it’s very cool. And they are partnered with Wish Upon A Wedding – a group that funds weddings for people who are terminally ill or have experienced challenges in their lives that make their dream weddings unlikely. You can see pictures of the couples helped by Wish Upon A Wedding and read their stories . . . it’s very cool what these groups are doing to help people. 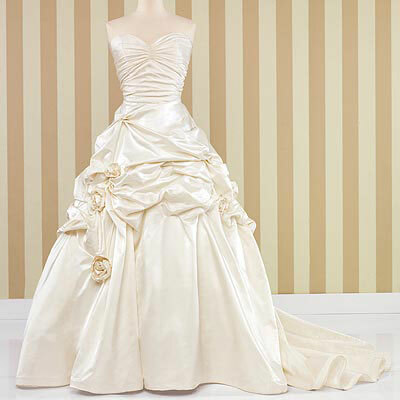 Dresses do not need to collect dust for a lifetime. Brides For A Cause could really use your donated dress to support their programs. When I first found this page I had this awkward moment where I thought you were going to be this horrible guy that ruined his ex-wifes wedding dress. After having looked around it seems you are a cool guy and have an interesting story. I have just bought my wedding dress from a debutante dresses store, which means it won’t cost a fortune, which I am sure you appreciate. Anyways I think I will buy your book and as a stressed out bride to be, give me something to chuckle about.